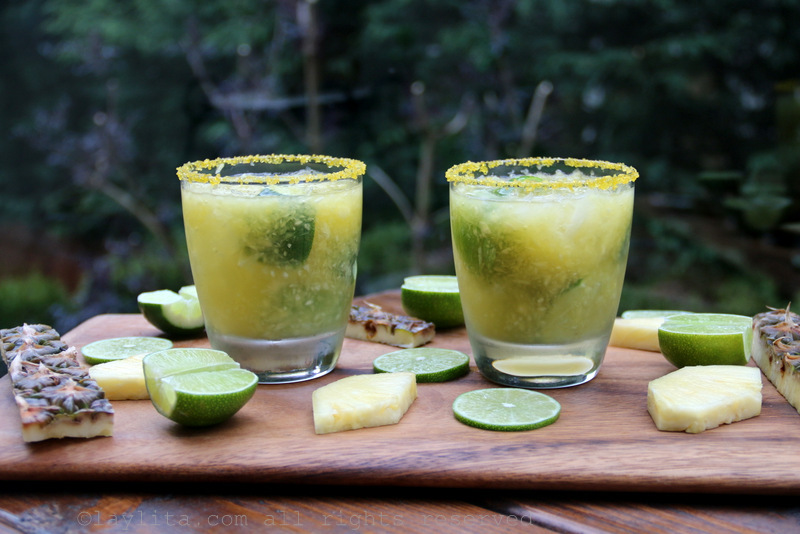 This refreshing Brazilian pineapple caipirinha recipe is made with pineapple infused cachaca, limes, sugar, crushed pineapple and ice. 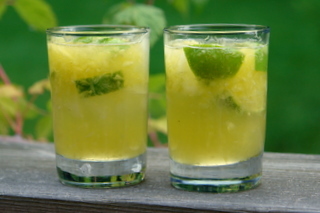 A caipirinha is a well-known Brazilian cocktail made with sugar cane alcohol called cachaca (pronounced cachaza), limes, crushed iced and sugar. It is a drink that is simple and delicious, however for reasons I will never understand a lot of bars and restaurants tend to mess it up. I’ve had crappy caipirinhas in a lot of places (from Ecuador to France), so I kind of gave up on them and decided they weren’t my kind of cocktail, until I had a real caipirinha on a beach in Brazil. That’s when I was shocked that I had missed out on something so easy to make and so good. I really don’t know how you could mess up making a caipirinha, fresh limes are definitely crucial and so is making them with cachaca. 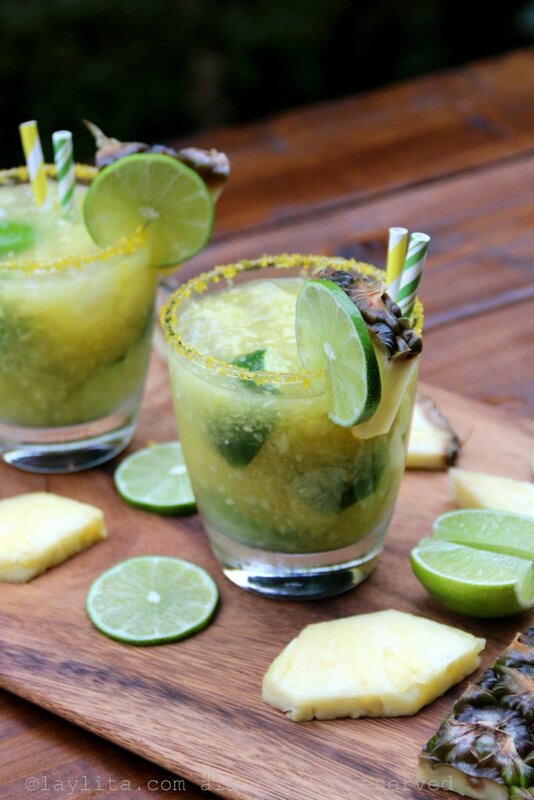 Though there are versions made with vodka and called caipiroskas, as well as with other types of alcohol. Somehow all those drinks labeled caipirinhas that I had previously tasted were not even close to that strong and refreshing drink I had in Brazil. 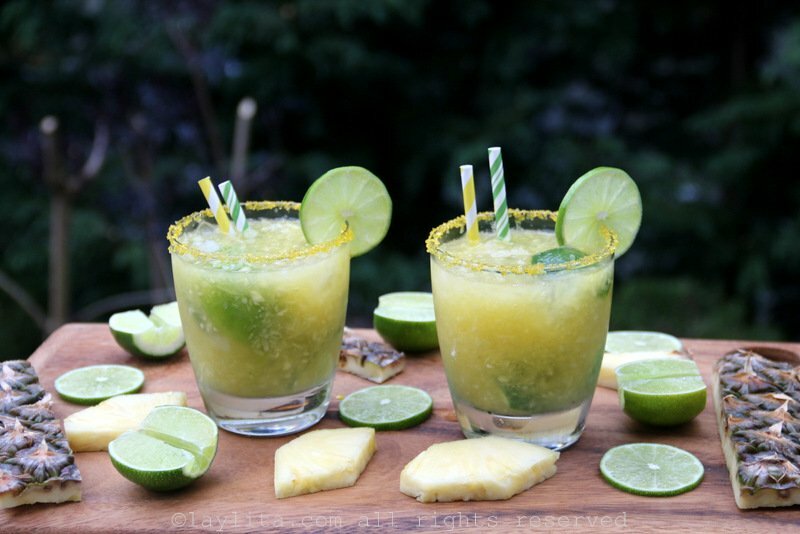 Refreshing Brazilian pineapple caipirinha recipe made with pineapple infused cachaca, limes, sugar, crushed pineapple and ice. 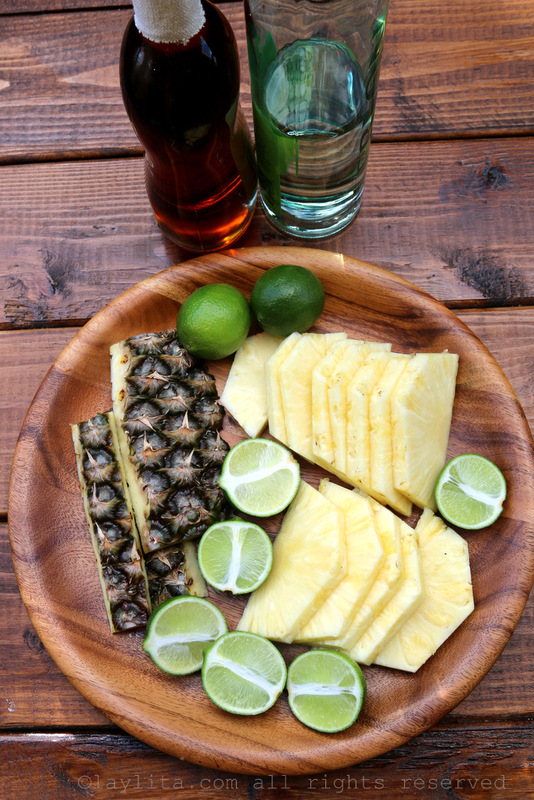 To make the pineapple infused cachaca place the pineapple slices in a large container, pour the cachaca over the pineapple slices, close tightly and let it rest in a dark cool place for a few days – but no longer than a week. Remove the fruit and strain the alcohol when it’s ready. Use a muddler to crush and mix the limes and sugar in a cocktail shaker. 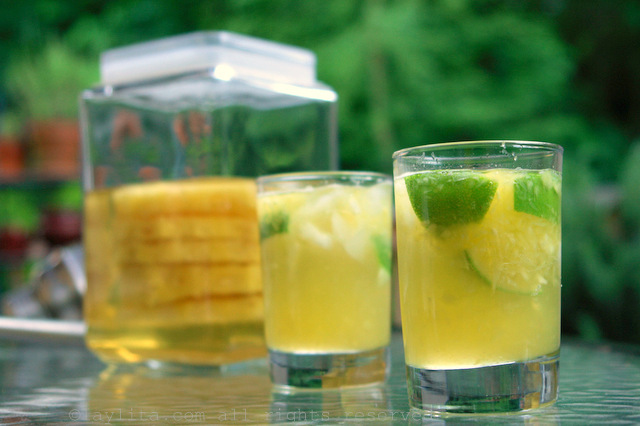 Add the cachaca, crushed pineapple, stir well and serve immediately over crushed ice. 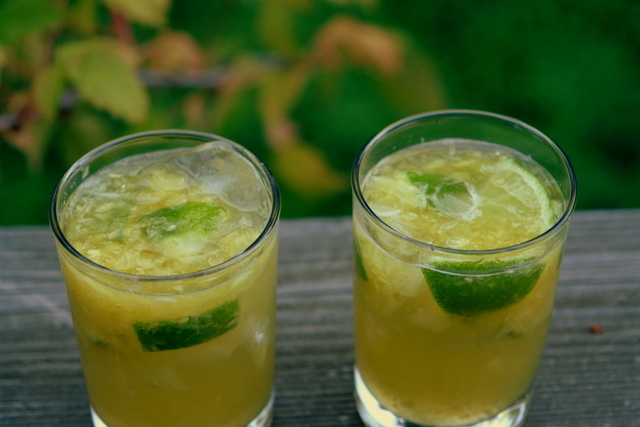 The classic caipirinha is made just with cachaca, limes, sugar and crushed ice. There are also a lot of fruity caipirinhas where you can add crushed berries, passion fruit, mango, pineapple, or any fruit you like. 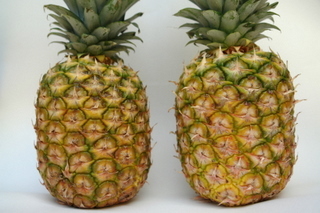 A while ago I tasted an aperitif drink of vodka infused pineapple, it was perfect, the taste of the pineapple was so fresh, and it inspired me to infuse the cachaca with pineapple for a few days before I made these pineapple caipirinhas. Cachaca is not as smooth as vodka, so the infused cachaca will have its distinct cachaca taste plus the flavor of the pineapple. Ideally the pineapple and cachaca should be left to infuse a few days, but you can also do it the same day if you need to. If you don’t have time to infuse the cachaca, you can just use regular cachaca. 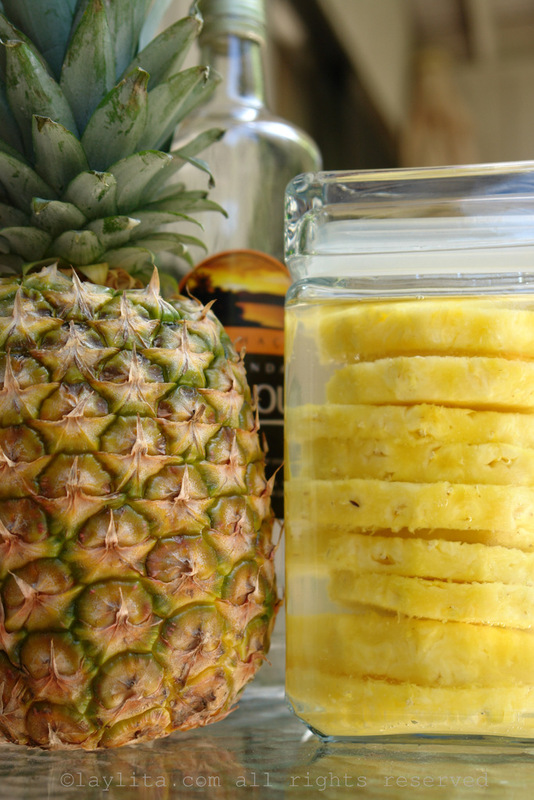 I also add freshly crushed pineapple to the drink, so it will have plenty of fresh pineapple flavor. I like to make 1-2 drinks at a time in a cocktail shaker, however for a large party it is easier to make them in a pitcher. 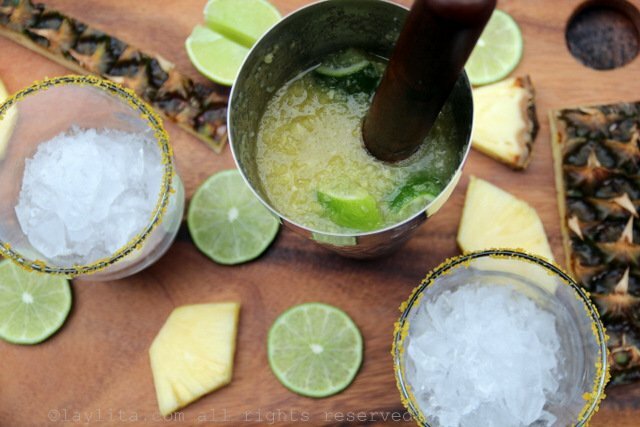 Just make sure that the limes and sugar are muddled well before adding the cachaca, crushed pineapple and crushed ice. 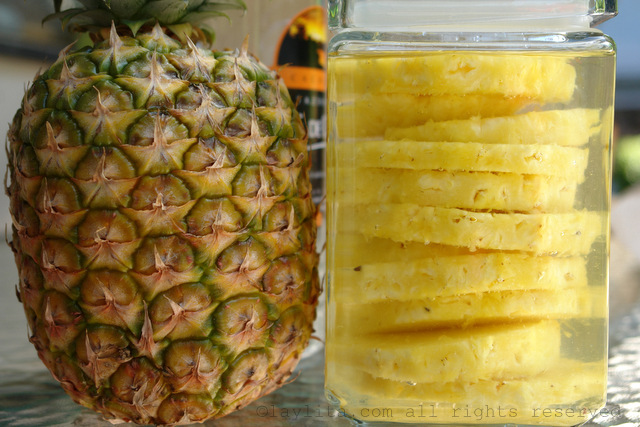 Tip: Don’t throw away the pineapple skins/core, use them to make this spiced pineapple chicha drink (can be served warm or cold). This is amazing! Wanted to try making this for a party, but what is the minimum amount to time to let soak without giving up quality results? Thank you, Laylita. Yours is my absolute favorite food blog and the one I refer all my friends to. I’ve learned a lot and gotten many compliments thanks to your gorgeous website! Looks great – just got a juicer as a wedding present so fancy trying this one!!! Wow! This looks so delicious, I want to make it NOW! Beautiful pictures! Thank you for sharing! 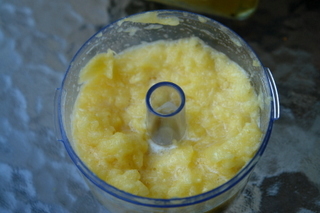 The soaked pineapple slices were too strong and bitter to eat so i chopped them then pureed them and pressed the puree through a chinois sieve for extra flavor. The cachaca is a nice yellow color and freezes well. I’m going to sweeten it with agave nectar instead of sugar and use fresh lime and ice for caipirinhas. Thanks for the advice. I like the organic key limes better too. Leblon is good, but not great. Usually overpriced, and tastes more like rum than most Cachacas do. Tropical flavors are easy to distinguish in it too. 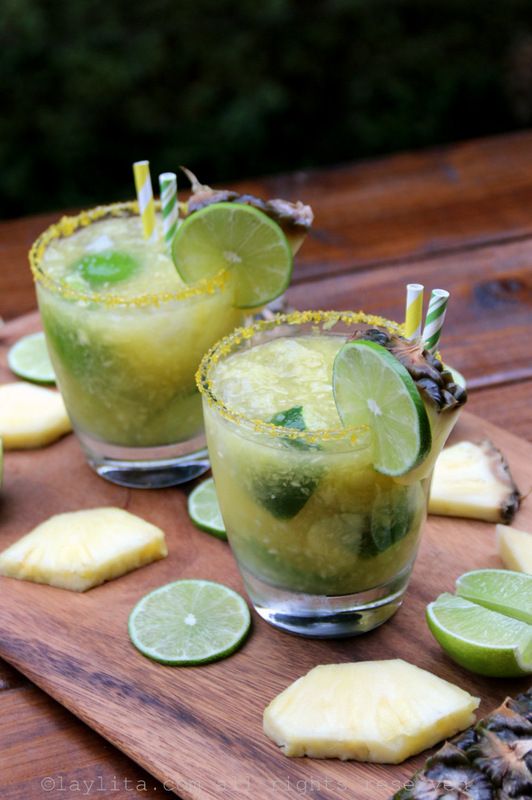 Caipirinhas are becoming more popular in the U.S. since Cachaca is in almost every liquor store nowadays. I’d really urge not to use rum though… Cachaca makes this drink. Good brands are Mae De Ouro and Cachaca 51, but stay away from Pitu. 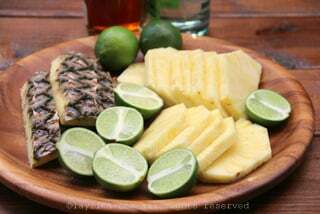 Laylita, do you puree the marinated pineapple slices with the infused Cachaca? 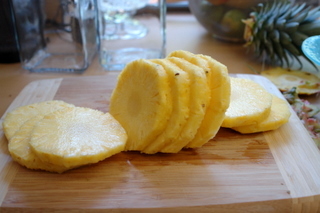 Or do you strain the alcohol out while removing the slices of pineapple and puree the fruit separately? 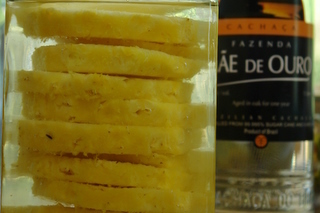 Chef Rob – I strained the alcohol out of the infused cachaca, but I didn’t puree the infused pineapple slices (I used fresh ones), we just ate the infused slices as a nice adult fruit snack. Speaking of brands of cachaca I usually use Cachaca 51, but the last time I went to the liquor store I bought one called Leblon, I haven’t even tried yet, but have you heard of it/tasted it and what are your thoughts? Cachaca is available in almost all liquor stores now so more people should make caipirinhas at home. 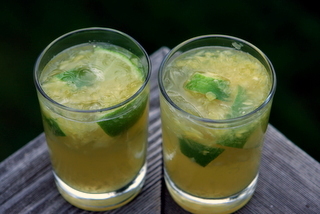 The caipirinha is the drink that the mojito was based upon and the #1 cocktail of Brazil. The only difference is you don’t add the chopped mint and club soda to it. And unlike those bacardi commercials, a real caipirinha/mojito uses cachaca, not rum. Sometimes simpler is better. Cachaca is fermented from sugar cane instead of molasses, which makes rum. Although in the same family as rum, cachaca is actually known as “firewater”… a different category of liquor. People who aren’t used to drinking firewater will feel its effects very quickly, although it is only 40% alcohol by volume, just like most vodkas and rums. 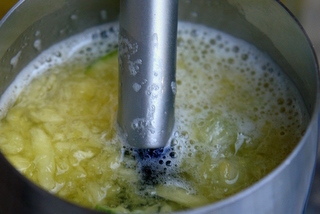 You can also check youtube to see instructional videos on how the caipirinha is made. 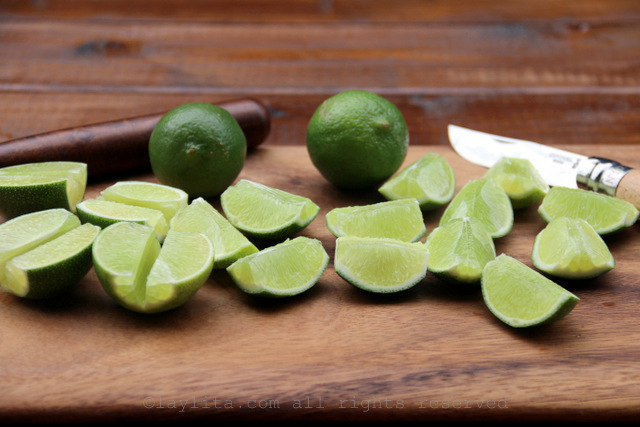 I still haven’t figured out which limes are the best for caipirinhas… Laylita, do you know? Tahitian, Mexican, Key, Persian?? 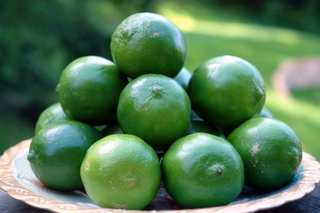 Living in Seattle, most of time I can only find Mexican limes, but when I lived in Texas I used to make caipirinhas with key limes (mainly because their taste reminds me a lot of the limes I had growing up in Ecuador). Is there substitute ingredient I can use in place for cachaca, could I use real fresh sugar cane? Hi Harriet – For a version without alcohol you could use juice from real fresh sugar cane – we call it guarapo in Ecuador; for an alcohol substitute to cachaca you could try using white rum. Very happy to come across your blog while visiting Brazil. Guess what I’m going to try today? Is it strange that I want one of these now? It’s 8 in the morning. These look so refreshing! I would put down a glass of Wine for this drink anytime!! Oh, I love cocktails! this one looks fabulous!